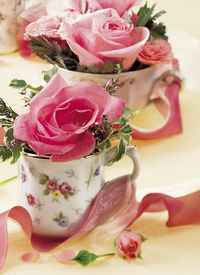 Add creative flair to your party decorations with easy fresh floral teacups! 1. Soak form thoroughly in water. Cut form into pieces to fit into teacups. 2. Cut roses very short so they rest on top of foam. Insert stems of roses and greenery into foam. 3. Arrange teacups on center of table. Weave ribbon loosely through teacups. Add Ivy or additional roses and petals if desired. Table glitter can make an attractive complement to this table decoration. Choose a glitter that matches the color or pattern of the teacups.